Lifestream cleanse is a one-stop pack that combines three potent, natural, real food supplements to help you gently remove waste material, heavy metals, and environmental toxins that may be stored in the bowels and fat deposits in the body. Detoxification is a natural, daily cleansing process, used by our body everyday to remove these toxins. Toxins or waste products that are not removed are stored in the body. The body’s natural ability to detoxify itself properly is dependent on functioning at in optimum health. The natural supplements in Lifestream Cleanse support the body’s own internal recycling and removing process. Lifestream Cleanse naturally purifies, nourishes and cleanses. 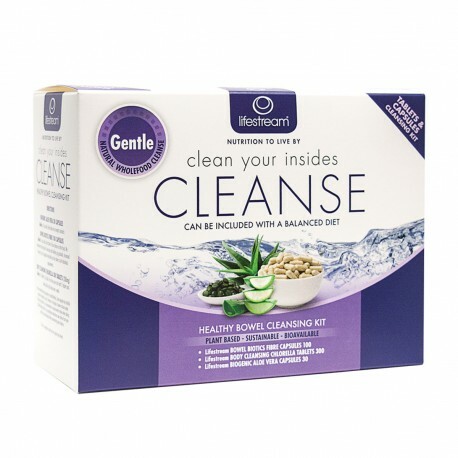 Lifestream Cleanse Kit is a comprehensive blend of biogenic aloe vera, chlorella and bowel biotics. The three way combination of each of these products, provides effective gentle detoxification support. Our modern lifestyle and diet often means a build up of toxins and waste within the body. It can be very beneficial at times to help support the workload of our internal detoxification organs, so we can function at our best. Biogenic Aloe Vera 30 caps - may soothe and calm the digestive tract and help support the liver. Bowel Biotics 100 caps - contain psyllium husks, rich in fibre to help eliminate waste, and act as excellent source of roughage for the bowel and probiotic cultures to maintain healthy bowel flora. Chlorella Powder 300 mini-tablets - a rich source of nutrients and is the ultimate source of chlorophyll, which helps give its powerful detoxification actions. Lifestream Cleanse Kit is a one-stop pack that combines three natural, real, potent food supplements to support the body's own internal recycling and removing process. Can help increase energy, mental focus and clarity. Lifestream Cleanse Kit Contains Lifestream biogenic Aloe Vera, Lifestream bowel biotics Fibre, and Lifestream body cleansing Chlorella. Aloe Vera gives a soothing and calming effect to the digestive tract and is also a liver tonic. Aloe Vera also promotes the growth of good bacteria. Lifestream bowel biotics Fibre contains psyllium fibre that helps to soften firm stools. It provides a source of prebiotics and probiotics that encourages the growth of good bacteria in the digestive tract. Lifestream bowel biotics Fibre also contains inulin that helps support reducing the fatty deopsits around internal organs. Lifestream body cleansing Chlorella helps to eliminate toxins from the body and acts as a blood cleanser. Lifestream Lifestream is a 100% New Zealand owned company specialising in bioavailable, ethical, plant-based health foods. Since 1980, we've been committed to the most natural and effective nutrition for the human body. Across our range of plant-based products, you will find everything from spirulina to sprouted superfoods, algal calcium to plant based super proteins. Essential Nutrition, Optimum Digestion, Natural Endurance, Enhanced Support and Women’s Health. It’s nutrition to live by.